In the 1980’s DEC researchers were designing a supercomputer based on the Goodyear MPP from 1983. Jeff Kalb was in charge of the division of DEC involved in this work. 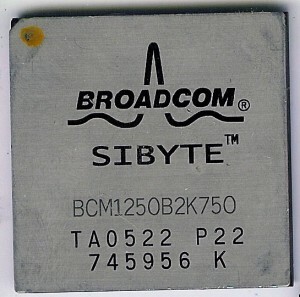 The original Goodyear MPP wa based on a 1-bit processor element (PE). DEC increased that to a 4-bit PE as well as increased the connectivity between PE’s. When DEC decided to not commercialize the supercomputer design Kalb left (with DEC’s blessing) to start a company of his own that would. Thus the creation of MasPar in 1987. 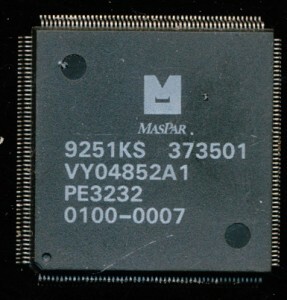 MasPar derives its name from the product it sought to create, a Massively Parallel supercomputer. These type of computers, also referred to as vector processors are SIMD machines, Single Instruction, Multiple Data. They perform the same operation on a very large set of data. SIMD instructions are now found on most all desktop processors, where they can greatly speed up processing of multimedia. In the late 1980’s there was several companies making such MPP computers. Perhaps the most famous was Cray, but there was also Thinking Machine’s Connection Machine, Intel’s Paragon (i860 based), nCUBE’s hypercube, Meiko Scientific’s CS-1 (Transputer based) and several others. Such systems cost from upwards of $100,000 each so sales were not vast, typically companies sold a few hundred to a few thousand systems. MasPar’s first design, the MP-1 was based directly on the research done at DEC. Each processing element contained a 4-bit ALU, a 1-bit logic unit, a 64/16 (mantissa/exponent) unit for handling floating point. 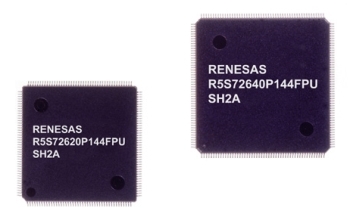 Each PE also had 48 32-bit registers. There were designed as a 32-bit RISC processor, which means, that with the 4-bit ALU, any ALU operation would take at least 8 cycles. This was considered acceptable in a MPP type system. Each custom VLSI CMOS MP-1 chip contained 32 individual PE’s. They were made on a 1.6u process and contained 400,000 transistors. Clock speed was a fairly low 12.5MHz but this allowed the chips to be air cooled with no special cooling systems. They were packaged in an inexpensive 208 PQFP, nothing special needed due to the low heat dissipation. A 1024 PE board (32 chips) dissipated only 50 Watts, and an entire 16k processor system dissipated less than 1,000 watts. Cult of Mac recently interviewed John Sculley, the former CEO of Apple. The interview is long, and very interesting. Sculley presided over Apple during some rather rough times. Steve Jobs in fact still wont talk to Sculley. This is interesting, as it was Sculley, and the result of a failure that ended up saving Apple, or at least significantly helping them stay in business. The Apple Newton is known as one of Apple’s biggest failures, however, it ultimately brought relief to the company. Apple began the Newton project back in 1987. In search of a processor that could handle the OS, and run on batteries Apple turned to ARM, then a small British company known as Acorn, whose main business was computers and processors for Acorn computers and BBC Micro computers. 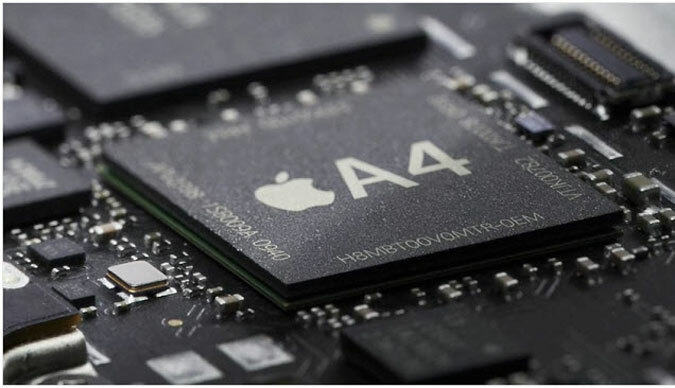 Acorn did not have the resources to design the processor Apple needed, so Apple, along with an Italian company called Olivetti took a 47% stake in Acorn. This cash infusion allowed ARM to develop the processor for the first Newton. 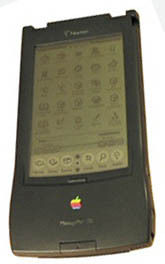 The first Newtons, or MessagePads, as the ones made by Apple were branded, were powered by a 20MHz ARM610 processor. 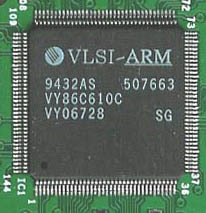 It was made by VLSI (the first silicon partner for ARM) and called the VY86C610. They were introduced in 1993 and continued production (in various forms) until 1997. Sharp, Motorola and several other companies also made Newton OS devices, but they enjoyed even less success then Apple’s. In 1997 Apple releases the eMate 300, a classroom targeted laptop system. It ran the slightly more advanced 25MHz VLSI VY86C710A ARM710A. 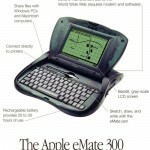 The styling of the eMate seems to have carried over to the first iBooks with translucent, rounded cases. The last of the line was the MessagePad 2000 and 2100, both of which were based on an ARM processor made by DEC and Intel called the StrongARM SA-110. 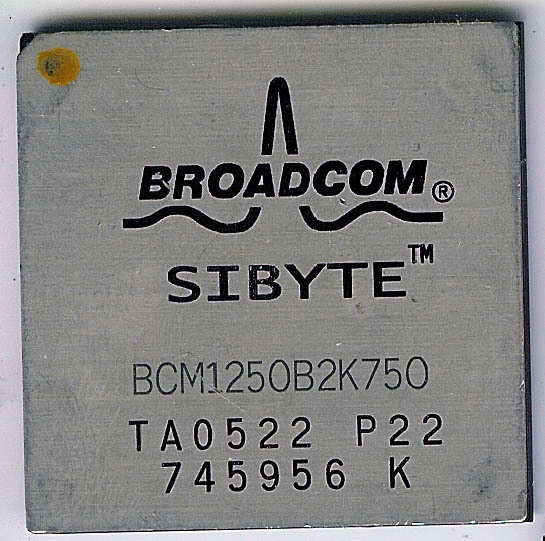 It ran at 162MHz and was at its time one of the highest performing designs for mobile devices available. Intel later developed the XScale line of processors from it, which they then sold off to Marvell. In 1998, among diminishing sales, Apple closed down the Newton division. Some of the original developers of the Newton OS went on to create a company called Pixo. ARM IPO’d that years as well as ARM Holdings. Apple sold their stake in ARM for $800 Million. This influx of cash came at a time when it was desperately needed by Apple, and gave them the time, and money they needed to ‘reset’ and return to profitability in a VERY strong way. A mere 3 years later, in 2001, Apple ‘changed everything’ with the release of the iPod. The iPod ran on a dual core 90MHz ARM7TDMI processor made by PortalPlayer. It ran an OS designed by Pixo. Apple subsequently bought Pixo, and likely returned a few old Newton employees to their old desks in doing so. All further iPods, iPhones, and iPads, and now the iTV run on ARM processors. 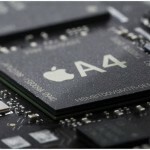 From the lowly 20MHz of the ARM 610 to the 1GHz+ of Apple own A4. The company that Apple helped get started, is now at the foundation of Apples core business. And it was all because of a ‘failure,’ the Newton. A rather large tragedy and loss. The CPU Shack sends its sympathy to the CPU collectors, and entire country of Poland for their loss. May God be with you all. There is no denying that e-readers are a cool piece of technology. One of the things that makes them so interesting, and popular, is the unique e-ink display. A bi-stable display that only needs power to CHANGE what it is showing. These displays use VERY little power since they only need to update content ever few minutes when say reading a book on them. They do however require a controller to make them work, which is a seperate chip, and cost for an e-reader. A kindle, or Nook is certainly nice, but the cost is prohibitive to many. Enter Freescale, they have developed the i.MX508 system-on-chip (SoC) combines a hardware Vizplex controller (e-ink controller) with a fast ARM Cortex-A8 applications processor and special e-reader power-savings modes.